Interested in furthering your career in ICT? Dar Guzeppa Debono in collaboration with the Gozo College Girls Secondary School is currently implementing a project entitled ‘LWIEN’ which is part-financed by the European Social Funds. The project will offer young adolescents who have emotional challenging behaviour, and/or are single mothers between 14 and 18 years of age, the opportunity of participating in accredited courses with the aim of instilling a process of reflexivity and take a critical stance towards life’s challenges. The project aims at engaging this target audience in a generative process of their potentials that will eventually lead to new lifestyles and better employment opportunities. Dar Guzeppa Debono is offering, free of charge, a foundation programme in ICT and soft skills to prepare participants for higher-level ICT studies in pursuit of an ICT career. Individuals can opt for either part-time or full-time training. Interested persons must be between the ages of 16 and 18 years. Individuals who will be in Form 5 in 2013 or are 15 years of age and will be 16 years of age in 2013 are also eligible to apply. 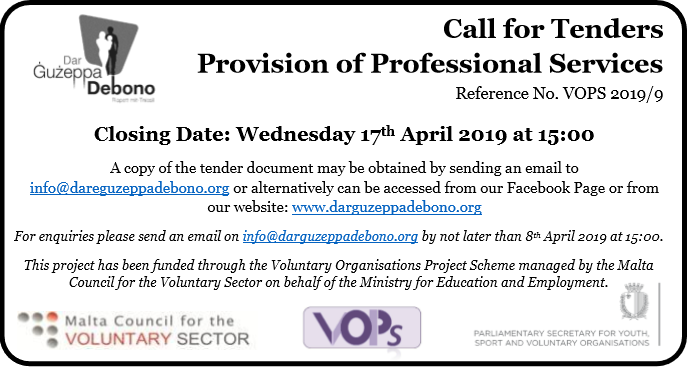 Further details on the eligibility criteria may be viewed on darguzeppadebono.org or by calling on 21552595. The number of places available is limited. Registrations forms can be downloaded from our website (further down on this page) or alternatively can be collected from Dar Guzeppa Debono, Lourdes Street, Ghajnsielem. The deadline for registration is 30th November 2012. Late registrations will not be accepted.